How my 2 year old learned about deer and death. It’s not every day that you wake up to the sight of a dead deer in your garden! I was first alerted to the fact when my dogs hadn’t come to whine at the door after being let out. My 7-year-old went to find them and see if they had gone into the woods at the bottom of our garden. She returned and said that there was something lying down behind the dog, I asked how big and she said she didn’t know. I was expecting to find a frog or maybe a bird but was confronted by the above. I wasn’t sure whether to let my 2-year-old see it, she really wanted to see the ‘reindeer’ but I thought she might be frightened. However, I’m always keen to avoid sheltering my children so we went to the bottom of the garden so that I could gauge her response. maybe it will get proper feet – does it have to go like this? (standing on tiptoe). Maybe we could put it in the shower or in the bath and make its leg better? No it has 4 legs like the dogs. Most animals don’t have arms. Perhaps when we talked about the deer not feeling hurt, she was thinking of feeling as touch. 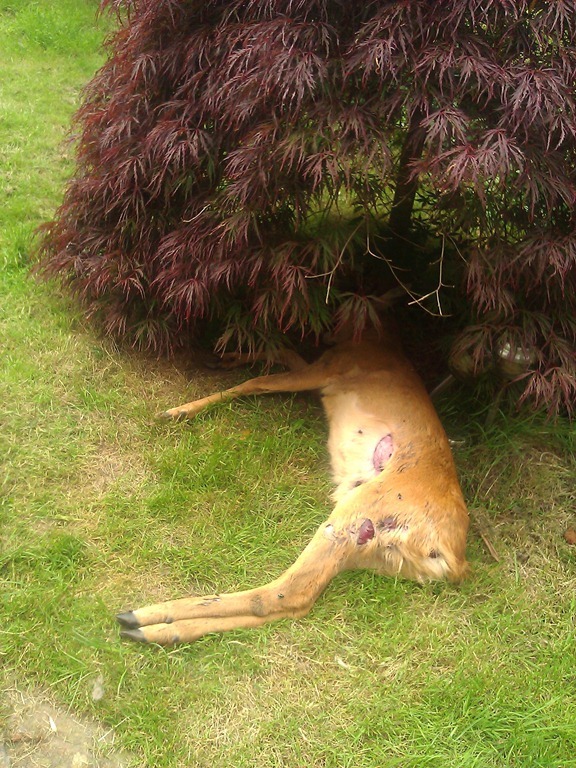 Not that it’s likely that many of you will encounter a dead deer in your garden, but would you know what to do if you did? Probably not, well neither did I and it took about 2 hours to find the answer. First port of call the vets – I thought they might be able to point me in the right direction. They gave me the number of the RSPCA and the local council. According to the council a wild animal can only be collected from the roadside or public place, if it is on private property then the disposal is your own responsibility. If I couldn’t find anyone to collect it then it became an environmental health issue and they would come and collect it. The RSPCA suggested I contact DEFRA . They said that they would normally advise people to dispose of animals in normal refuse, but that a deer probably wouldn’t fit! Their advice was to call the council again. The senior staff at the council finally authorised collection free of charge. The men arrived and my 2-year-old delighted in showing them the way, saying ‘we think it is dead’. I think they had visions of an animal that as soon as they moved it would start kicking out – I reassured them that it was dead. The small antlers were caught around the tree and the deer was too big to fit in the bag they had brought so they carried it up the garden. my daughter said when she saw its eyes wide open. She wanted to see them put it in the van and know where it was going. I told her that they would probably bury it. They put it in a yellow bag and onto the truck. Are the mummy and daddy reindeer dead? It’s alright reindeer you’ll get better soon. We waved goodbye to the deer and the men. So that was her first experience of death – we will see what other questions it raises in the coming days. For now she has gone to bed with her cuddly reindeer kissing it’s legs and telling it she will give it a plaster to make it better.